Announcement Welcome to Little Garden Pottery! Here is where you can find a colorful and unique piece of pottery for you to enjoy in your home and garden. It is through my passion of ceramics and gardening that I have created a line of simple yet beautiful functional pottery, meant to inspire others to slow down, take a break, and connect with the natural world. Follow me on Instagram for a view behind the scenes in the studio, and for more info on the latest shop updates! Welcome to Little Garden Pottery! 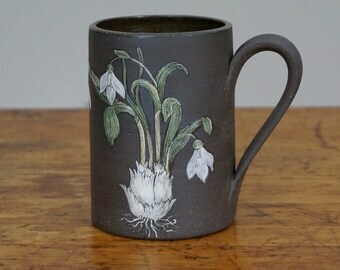 Botanical Snowdrop Mug (#106) 14-16 oz ~ Hand Painted Mug ~ Handmade in Studio ~ READY TO SHIP ! 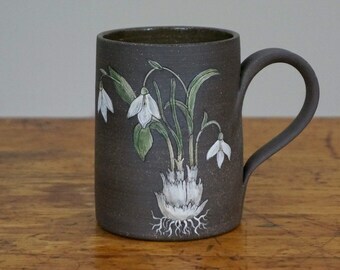 Botanical Snowdrop Mug (#108) 14-16 oz ~ Hand Painted Mug ~ Handmade in Studio ~ READY TO SHIP ! 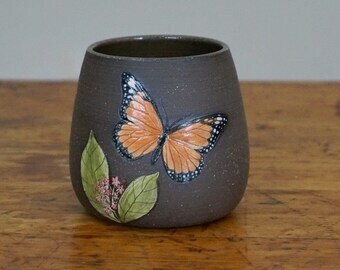 Monarch Butterfly & Milkweed Botanical Tumbler (#120) ~ 12 oz ~ Ceramic Wine Glass ~ Handmade in Studio ~ READY TO SHIP ! 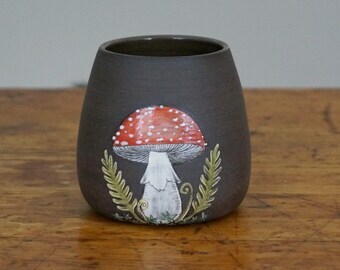 Red Mushroom and Fern Botanical Tumbler (#113) ~ 12 oz ~ Ceramic Wine Glass ~ Handmade in Studio ~ READY TO SHIP ! 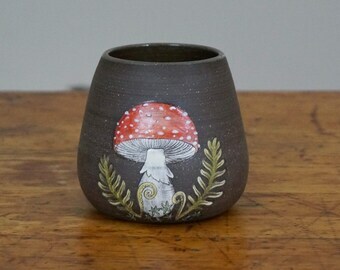 Red Mushroom and Fern Botanical Tumbler (#112) ~ 12 oz ~ Ceramic Wine Glass ~ Handmade in Studio ~ READY TO SHIP ! Red Mushroom and Fern Botanical Tumbler (#111) ~ 12 oz ~ Ceramic Wine Glass ~ Handmade in Studio ~ READY TO SHIP ! 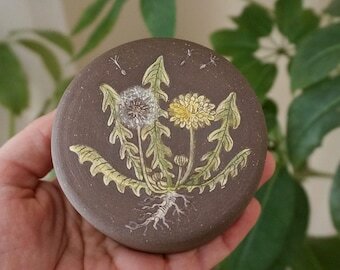 Dandelion Lidded Jar (#131) ~ Handmade Botanical Jewelry Box ~ Handmade Jewelry Box ~ READY TO SHIP! 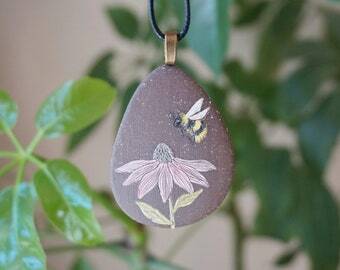 Echinacea & Bumblebee Pendant Necklace(#134)~ Ceramic Jewelry ~ Ready to Ship! Echinacea & Bumblebee Pendant Necklace (#136)~ Ceramic Jewelry ~ Ready to Ship!! 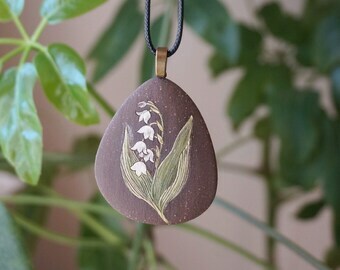 Lily of the Valley Pendant Necklace (#146) ~ Ceramic Jewelry ~ Ready to Ship! 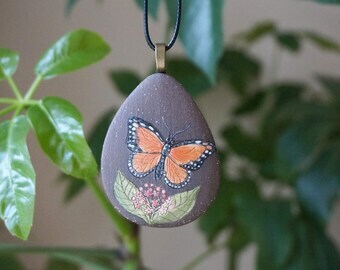 Cabbage White Butterfly & Forget-me-not (#139) ~ Ceramic Jewelry ~ Ready to Ship! 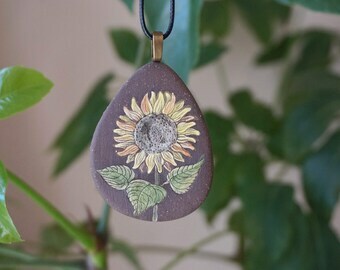 Sunflower Pendant Necklace (#140) ~ Ceramic Jewelry ~ Ready to Ship! 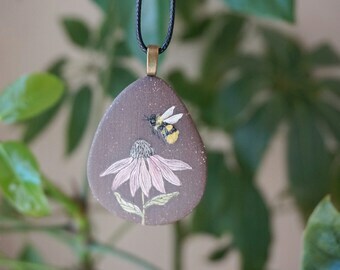 Echinacea & Bumblebee Pendant Necklace (#137) ~ Ceramic Jewelry ~ Ready to Ship! 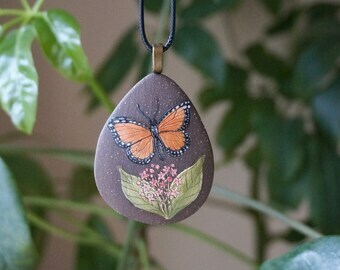 Monarch & Milkweed Pendant Necklace (#141) ~ Ceramic Jewelry ~ Ready to Ship! 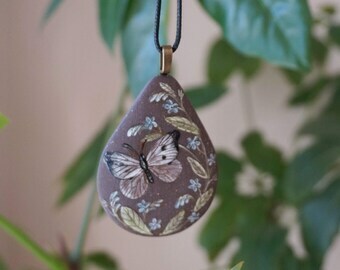 Monarch & Milkweed Pendant Necklace (#142) ~ Ceramic Jewelry ~ Ready to Ship! 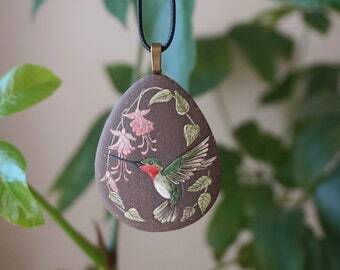 Hummingbird & Fuchsia Pendant Necklace (#143) ~ Ceramic Jewelry ~ Ready to Ship! 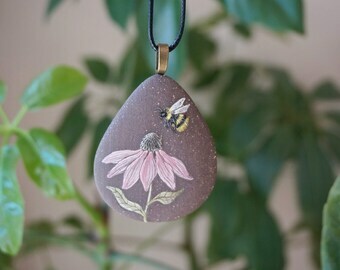 Echinacea & Bumblebee Pendant Necklace(#133)~ Ceramic Jewelry ~ Ready to Ship! Blue Mushroom Botanical Pendant Necklace(#16)~ Ceramic Jewelry ~ Ready to Ship! Blue Mushroom Botanical Pendant Necklace(#6)~ Ceramic Jewelry ~ Ready to Ship! Red Mushroom Botanical Pendant Necklace(#3)~ Ceramic Jewelry ~ Ready to Ship! Blue Mushroom Botanical Pendant Necklace(#8)~ Ceramic Jewelry ~ Ready to Ship! Dandelion Pendant Necklace (#145) ~ Ceramic Jewelry ~ Ready to Ship! This piece is perfect, a really fantastic artist. I would highly recommend this potter. Botanical Cabbage White Butterfly & Forget-me-not Mug (#104) 14-16 oz ~ Hand Painted Mug ~ Handmade in Studio ~ READY TO SHIP ! Beautiful! I adore it, thank you! 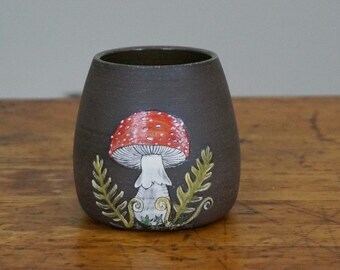 Botanical Red Mushroom & Fern Mug (#101) 14-16 oz ~ Hand Painted Mug ~ Handmade in Studio ~ READY TO SHIP ! Mushroom & Fern Lidded Jar (#128) ~ Handmade Botanical Jewelry Box ~ Handmade Jewelry Box ~ READY TO SHIP!!! 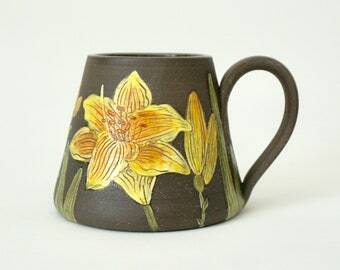 Yellow Daylily Botanical Mug ~ 12 oz ~ Hand Painted Mug ~ Decorative Mug ~ Handmade in Studio ~ READY TO SHIP ! Happy Black Friday! 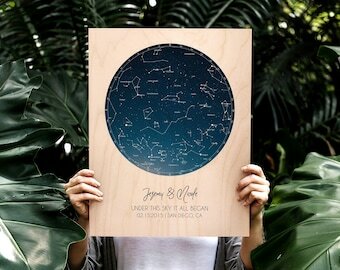 Everything in the little shop is 25 % off! 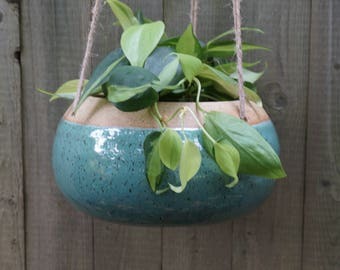 Turquoise POD AIR Hanging Planter ~ CHOCOLATE Clay ~ Small ~ Succulent Planter~ Handmade in Studio ~ Ready to ship !!! This large, blue, Pod Air hanging planter looks great in my living room with succulents! 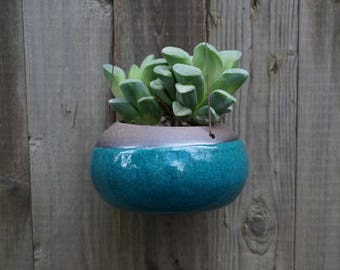 Blue Pod Air Hanging Planter ~ Large ~ Succulent Planter~ Handmade in Studio ~ Ready to ship !!! Little Garden Pottery produces simple, rustic, and colorful pottery for the home and garden. 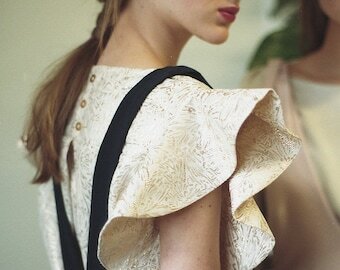 The pieces are handmade with love in my home studio that is surrounded by a small country garden. 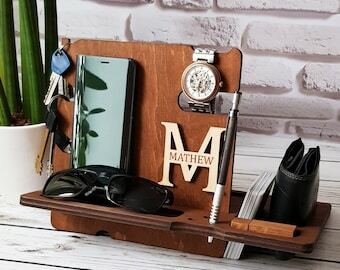 The well thought out line of products include traditional pieces such as mugs, planters, vases, as well as some more unique forms. I started working with clay in high school, but did not pursue it as a career. Instead I got my degree in Biology, and worked at a variety of places trying to find the right fit. I got involved with the organic and sustainable food movement, working for and managing some start-up businesses including local food cooperatives and a small organic farm. My entrepreneurial spirit grew, and I decided that what I wanted more than anything was to combine two passions of mine, both of which involved transforming the earth. So I set upon starting a business creating and designing a beautiful line of pottery, as well as growing a little cut flower garden. Each unique pottery piece has gone through a long and thoughtful process. It is hand thrown on my pottery wheel, trimmed, fired in the kiln twice, and decorated with a variety of clays and glazes. I am very peaceful and content while creating these, and I hope a little bit of that joy is carried along with them wherever they go. Elizabeth uses her experience derived from organic farming, botanical illustration, as well as ceramics, to create a high quality line of pottery for the home and garden. She is also ceramics instructor in Rhinebeck, NY. Basar has experience in fields of product design and research for over ten years. He is the recipient of several design awards and recognitions. He has interest in bio-intelligence, sustainability and human-centered design. He is a dreamer. Daisy May is Elizabeth's personal assistant. She is extremely helpful making sure that her lap is warm, her coffee mug is full, and she has someone to talk to. Gulliver follows Elizabeth everywhere making sure that she stays focused, on task, and that her work is up to par. Luna is wonderful at keeping deer and rabbits out of the little garden, and making sure Elizabeth feels safe in her backyard studio. 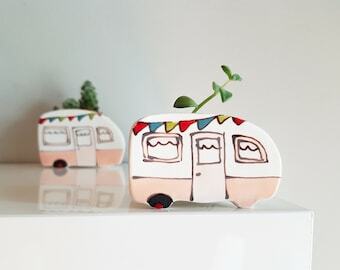 Welcome to the Little Garden Pottery shop on Etsy! All items are handcrafted in our magical pottery studio in New York. We are grateful for you and your business! If you are not satisfied with your purchase for any reason, please reach us within 7 days of receipt. We will refund you the total amount of your purchase as soon as we receive the item. We just ask you for a safe return of work and return shipping costs. If the piece arrives damaged, please photograph all pieces of the item, the shipping materials and the box and email the photos to us. We'll reimburse you for the total cost of your purchase, including the shipping cost. If there are any missing or incorrect orders, contact us regarding the issue and we will ship replacements immediately. 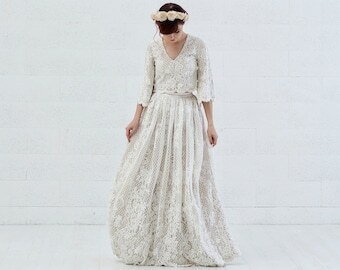 We accept PayPal and credit cards through the Etsy store. We also accept personal checks. Items will be shipped as soon as the payment is verified. While we strive to have inventory for all items available online, in some cases pottery is made to order. We ship within 1-5 business days after receiving your order. We ship one day per week. We use USPS priority mail and your items will be insured up to $50. For orders of several pieces, we try to combine shipping costs whenever possible to save you money. We mail to the address that is listed on your Etsy and/or Paypal account. Please make sure that all your addresses are updated. If you are purchasing an item as a gift, make sure to enter the correct shipping address during check out. We try to reuse packaging materials as much as possible in order to reduce your cost as well as the environmental impact. We usually ship within 4-8 weeks upon receiving your order. We will customize the shipping procedures as well as packaging materials upon your request.